You may wonder about the process involved in stage hypnosis and how it relates with hypnotherapy. Perhaps you are a practitioner of one or both of these approaches and then again, perhaps not. Some people have very clear ideas and may have made decisions about how these seemingly different aspects of hypnosis relate. Others may be uncertain and question how to apply what a stage hypnotist might do, in a clinical venue. Join us and refresh your mind as Dave Hill leads this exploration to discover how to use the knowledge we have in the hypnotic techniques we already know and round out our abilities to become even more effective in all aspects of hypnosis. You may be surprised to discover that you already use skills of the craft in ways that you hadn't before considered. 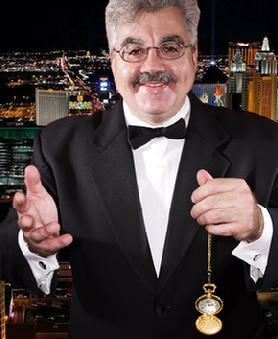 Dave has performed at numerous casinos in Las Vegas, Reno, Lake Tahoe, and Atlantic City as well as Comedy Clubs, Colleges, State Fairs, Festivals, and High Schools across the country. He has also entertained for major corporations, such as: GE and Google. He has been seen on numerous television shows, including Mythbusters. Dave is certified as a Master Hypnotist by the National Hypnotism Training Institute and as a Certified Hypnotherapist and Advanced Hypnotherapist by the National Guild of Hypnotists and the Hypnotism Training Institute. The International Hypnosis Federation also certifies him as a Professional Stage Hypnotist. Advanced Neuro Dynamics certifies him as a Hypnosis Trainer. Dave has trained and worked with famous hypnotists such as Marshall Sylver, Jerry Valley, Gil Boyne, and Ormond McGill.